Most fans would be astonished and angry that their beloved team, who was doing so well, received little to no news coverage. This is not so with the Ducks; we are frustrated, but not surprised. We are used to being looked over, but do not fret fellow Anaheim lovers, for last night might very well have been the turning of the tide. This game was highly anticipated. A record-breaking sell-out crowd at the Honda Center watched the two best teams in the NHL face off in a fierce battle for glory. The Chicago Blackhawks were not a team to take lightly, having gone undefeated for a good chunk of the season, but neither was Anaheim whose players and coaches have proven their worth ten times over this year. This makes the thirteenth straight win at home for the Anaheim Ducks who are just three points behind Chicago with the Los Angeles Kings trailing fourteen points behind them. The first period started out well for them with a goal from Peter Holland early on, but it was countered within minutes by Jonathan Toews. The rest of the period went without another goal, both teams battling it out with an intensity and determination I have not seen since the Ducks beat the Detroit Red Wings in the Western Conference finals in 2007. When asked about the success of Chicago, Bobby Ryan had this to say, “They’ve made a statement to run away with it so far, and we’ve quietly just gone about our business. This is the first game the media has really hyped what we’ve done. And we’re ok with that. To be three points back with a game in hand is huge.” Though most of the players try to be humble and accept things as they come, it looked as though Anaheim would not accept a defeat if they still had air in their lungs. Ryan Getzlaf, the team’s captain, was sick with the flu; apparently, he could barely get out of bed in the morning, but he was not going to miss the most important game of the regular season. He pushed through it and came out with two assists–it was truly remarkable. ANAHEIM, CA – MARCH 20: Bobby Ryan #9 of the Anaheim Ducks celebrates a goal against the Chicago Blackhawks in the third period at Honda Center on March 20, 2013 in Anaheim, California. The Ducks defeated the Blackhawks 4-2. It was nearly the end of the game when the Ducks began to score. First with a tip-in from Bobby Ryan and then another from Teemu Selanne, who has not scored a goal since March 1. When asked how it felt to break out of that slump, he had this to say, “It’s a big relief. Lately I’ve had some bad luck. Today I had so many chances. In the last couple games, luck was not on my side. But it’s always good. That gives me a lot of confidence and it’s a good feeling. But the win was the most important. The good thing is we found a way to win the game.” In a last-ditch effort, Chicago took Crawford out of the net to put an extra attacker on the ice, but this did not turn out in their favor. Instead, nineteen minutes into the third period, Sheldon Souray obtained a goal off of the empty net. 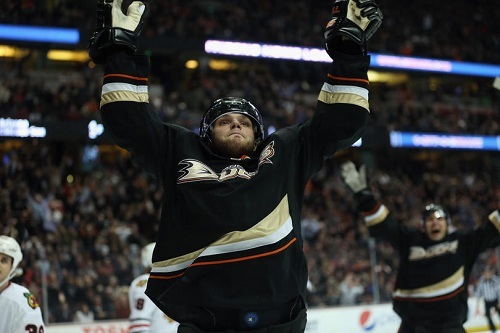 Anaheim beat Chicago 4-2 last night—it is the second comeback win the Ducks have over them this season.